Wood Library is committed to reducing our environmental footprint and promoting environmental stewardship at all levels of our organization. Our goal is to minimize Wood Library’s impact and maximize the ability of future generations to live, work, and play in our shared natural environment, with equal access to clean air, clean water, and natural resources. We will strive to minimize pollution and waste, conserve energy and water, protect habitat, support renewable energy resources, buy environmentally friendly products, and encourage environmentally preferable transportation. These efforts will extend to contractor and supplier relationships, and we will encourage contractors and suppliers serving or otherwise acting on behalf of Wood Library to meet our standards of environmental performance. We will offer ample opportunities for community members to learn about environmental stewardship and will seek out opportunities to partner with other organizations that share this commitment.Employee understanding and involvement are essential to the implementation of this policy. All employees will receive a copy of this policy and be informed about Wood Library’s efforts to improve our environmental stewardship. Everyone associated with Wood Library (staff, trustees, volunteers) will be involved in supporting our goals. 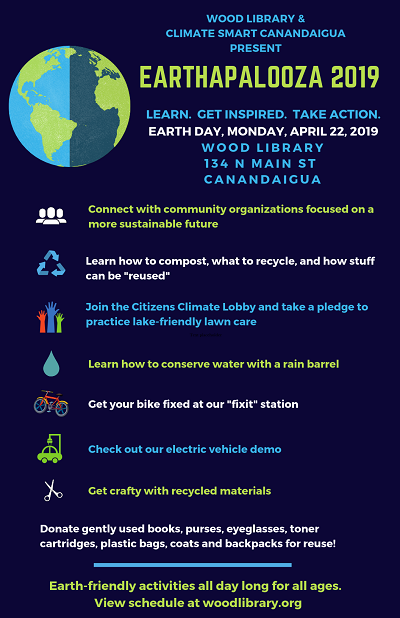 CANANDAIGUA, NY — Wood Library and the City of Canandaigua’s Climate Smart Canandaigua (CSC) will host Earthapalooza on Earth Day, Monday, April 22, 2019 at Wood Library, 1fThis all-ages event is free and open to the public. Earthapalooza is designed to raise awareness of environmental issues and educate the community on actions they can take to help reverse climate change, with a focus on waste management and food waste diversion. A schedule of events is listed below. Note: Wood Library is hosting additional Earth-friendly events throughout April. Visit woodlibrary.org for more information. ● Learn how to divert waste from the landfill, how to compost, what to recycle, and how “stuff” can be reused. ● Join the Citizens Climate Lobby and take a pledge to practice lake-friendly lawn care. ● Learn how to conserve water with a rain barrel. ● Get your bike fixed at our “fix-it station”. ● Check out our electric vehicle demo. ● Donate gently used books, purses, eyeglasses, toner cartridges, shoes and boots, coats, and backpacks, and plastic bags for reuse!